Taking its name from The Clash’s song, “Police and Thieves” at the Hyde Park Art Center is a charged exhibition that examines the reality of minorities, crime and law enforcement. Curators Mario Ybarra, Jr. and Karla Diaz, both based in Los Angeles, present artists from both the West Coast and Chicago. The result is a tightly curated exhibition where works speak to each other no matter where their creators live. Unfortunately, this is also to say that the problems of violence are not limited to or unique to Chicago, or L.A.; they’re the problems of America. Ben Stone, Neighbor, 2010, painted laminate on wood, 41 × 31 inches. Courtesy of the Hyde Park Art Center. Reappearing from his excellent solo show at Western Exhibitions last September, Ben Stone’s Neighbor may be the first work that catches your attention when you walk in the gallery due to its uncanny nature. You know what the sculpture is of, it’s something you’ve seen many times, but you can’t quite place it. That was my experience when I first encountered it. The sculpture is in fact a three-dimensional iteration of the masked and ominous character that populates the neighborhood watch signs ubiquitous in Chicago and spread all over the United States. Like the federal terror alert system, though it was dismantled recently, the neighborhood watch indicates we are terrified of something, but we’re not sure what. Stone makes that apparent in his blobby, diminutive figure that signifies the fear of the unknown. Arnoldo Vargas. 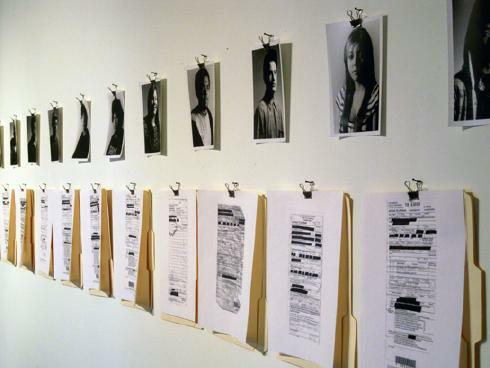 Notice To Appear-Defendant’s Copy, 2009, silver gelatin prints, manila folders, photocopies. Dimensions variable. Courtesy of Hyde Park Art Center. The accused range in age from 14 to 18, which means that most of these misdemeanors will be wiped from their records on their 18th birthday. But Vargas is asking us how appropriate it is to label children as criminals, even if their record may be suppressed eventually. There’s a mental component to having a misdemeanor on your record: you are now tainted in society’s eyes; you have a criminal past. Every job application will remind you of it, as you decide what box to check for “Have you ever been convicted of a crime?” Vargas questions whether giving a young person a misdemeanor criminal charge for “possession of tobacco products” is a useful exercise for law enforcement, if it is justice at all, and if handling out criminal records will actually change behavior. Arnoldo Vargas, In Memoriam, Bike Misdemeanor leads to Post-Injunction “Officer Involved Shooting” II, PCH and Eubank ave,(detail), 2010, lightjet print, 30 × 20 inches. Courtesy of the Hyde Park Art Center. Across the room from this installation is a single photograph from Vargas, simply clipped to the wall. It depicts a roadside memorial, the urban tribute to a tragic death. These are common all over the U.S.; perhaps most visible in Chicago is the Ghost Bike version of these memorials that pay tribute to cyclists killed by motorists. This image by Vargas ties directly into his Notice to Appear. As aforementioned, one of the citations is “riding a bike without a helmet.” I had found that citation frivolous when I read it and still do, it speaks to the racial profiling that young people may be subjected to. Here such a charge takes a chilling turn, indicated only by the title of the photo, In Memoriam, Bike Misdemeanor leads to Post-Injunction “Officer involved in Shooting” II, PCH & Eubank ave. Silly charges leading to a senseless death. Vargas’ photo is a triplicate portrait of the memorial that documents its three stages of existence, appearing as a photo-within-a-photo-within-a-photo. I’m going to leave the temporality of the image and Siegfried Kracauer out on this one, though it underwrites the image as art. Vargas is addressing how the community participates in both remembrance and memorialization. In the instance he presents the will of the community that has created a memorial three times, after being twice removed by city services. (California has struggled with policy on street memorials as they may lead to more violence.) Vargas’ intervention represents a fourth and final recreation: by committing the image to the realm of art, Vargas creates a memorial that can never be removed by city services. Ray Noland, aka CRO, is also represented in the exhibition by two pieces. He’s at his best in the spray paint stencil work located down the hall, above the first floor entry. Executed directly on the wall in a seemingly brisk manner, Officer Frugoli preserves its street art feel and activates an awkward niche in the building; it’s also visible from the exterior. Noland is doing what he does best in this piece, making a searing indictment of business-as-usual Chicago. Officer Frugoli references a shameful episode that made Chicago headlines in 2009. ABC news describes the initial event: “Investigators say Frugoli was off-duty and had a blood alcohol content three-times the legal limit when he slammed into the disabled Dodge Intrepid driven by Andrew Cazares. Cazares's vehicle was stopped in the right lane on the outbound Dan Ryan expressway near 18th Street, possibly with a flat tire, when Frugoli's black Lexus SUV rear-ended the car, which then burst into flames.” Also killed in the crash was 21-year-old Fausto Manzera, a marketing student at DePaul University. After the accident, it came to light that the men killed were graffiti artists. Soon street art and stickers were appearing downtown featuring Frugoli’s mug shot and criticizing the fact that he killed two men and walked out of jail just two days after the event on $500,000 bail. All of the pieces I’m aware of have been removed. The revelation that the men were graffiti artists led to some truly disgusting and racist comments on police blogs, which I had the misfortune of finding during my research. In a truly bizarre, misguided and insensitive move the Fraternal Order of Police allowed use of their hall for a fundraiser for Frugoli at $50 a plate. Unsurprisingly this caused outrage in the community. In short, this was an avoidable tragedy that that brought out tensions simmering in Chicago, just below the surface. Ray Noland, aka CRO. Officer Frugoli, 2011, spray paint. 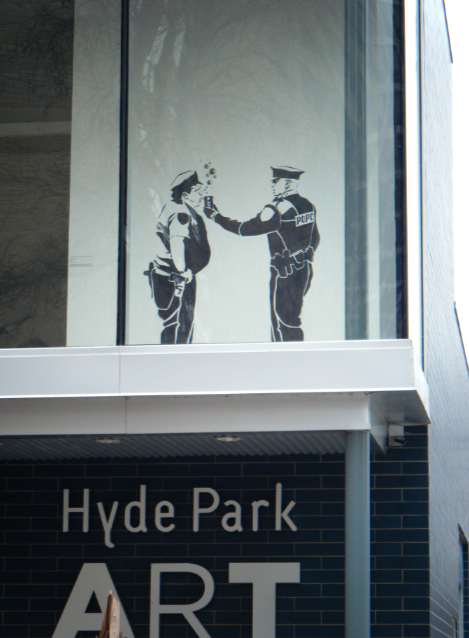 Image courtesy of Hyde Park Art Center. Noland’s biting work captures the painful ironies of this situation. A trim and fit policeman (bearing the word “POPO” on his clothes) administers a Breathalyzer to a disheveled, overweight Frugoli, who has hiccup bubbles floating upwards. The Breathalyzer reads “.277,” Frugoli’s actual blood-alcohol content after the crash, over three times the legal limit. Even if one isn’t familiar with the story and particulars of Frugoli, the unnerving image of police policing police carries through. Noland asks where in Chicago can we put our trust if the ones who are said to serve and protect are instead drinking and driving. 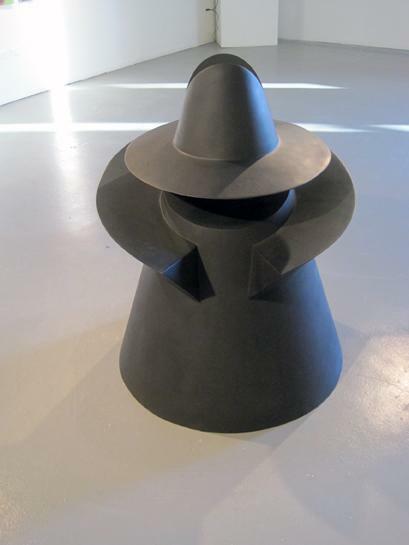 Unfortunately, this may be one of the last pieces from Ray Noland seen in Chicago. In a phone interview, the artist said he’s so disappointed with the election of Rahm Emanuel that he will follow through with longstanding plans to leave the city. Recently, the artist was charged with misdemeanor defacement, relating to alleged street art activities. Noland pled guilty and there’s now a sadly ironic twist when viewing his work where it exists as art. The only exception to this well interwoven exhibition was the video piece from the Los Angeles Poverty Department, State of Incarceration. Taking as its starting point the very serious fact that California has the highest number of prisoners in the world, State of Incarceration is a documentation of an avant-garde theatre performance in a prison-bunk-like setting. Unfortunately the narrative is very difficult to follow with lots of bellowing and ends up seeming like a vignette from Scared Straight!. However there’s no doubt that the performers are earnest and want to communicate. Exhibitions like “Police and Thieves” may not be overtly visually stunning, but they provide an art experience that prompts one to critically reflect on and re-evaluate their community from another’s viewpoint. It seems that this kind of experience may get more and more rare. Recently a reporter writing for the Chicago Tribune extolled the therapeutic virtues of art, advocating for the “simply aesthetically pleasing” in the face of “real-world issues” like the “news from Japan or Libya.” “Purpose” and “politics” are important, but only as long as they’re expressed “eloquently enough to come across in a glance.” As if it's wrong to dig into art further than a single glance, or take time to think about it. Even an encounter with true beauty should spark some sort of higher thought than “pretty, predictable, easily digestible.” Let’s hope that artists and exhibitions like “Police and Thieves” continue to question and deconstruct our world and reality, rather than just make it pretty.